(1) The Conference did not start well. There were significant sound problems but the video wall is terrific. Pictured above is NY Mayor Michael Bloomberg when he addressed the Winter Gardens this afternoon. The Spectator's James Forsyth interpreted the Bloomberg invite as potentially offensive to our Republican allies across the pond. I disagree. It's good to have the mayor of one of the world's greatest cities address our party. (2) William Hague has a rival as best conference speaker. Most people I've spoken to in the bars thought Boris Johnson stole the day. That's certainly Sky's view. (3) "Rebalancing" is the word that describes this week. Alongside the modernising emphasis on a gentler, greener conservatism there's lots of talk of lower taxation and a very tough approach to crime. There's even rebalancing in the wardrobes of the über-modernisers. Francis Maude was spotted wearing a tie! Theresa May's boots must win the overall award for surprising wardrobe choice, however. Click here for a photo. (5) The latest ConservativeHome survey of members pointed to a 3 to 1 preference for loyalty over candour from MPs. Michael Ancram's decision not to give any interviews has been widely noted. There is a general hunger for unity here in Blackpool. (6) I was on a panel earlier this evening with Peter Oborne, Nick Herbert and Jeremy Hunt - discussing David Cameron's relations with the grassroots. Tune into tomorrow's World at One on Radio 4 for highlights. The meeting came alive when one activist accused the BBC of systematic bias against the Conservatives. I almost felt sorry for Martha Kearney - such was the hostility that the audience felt for the BBC. (7) There's one question everyone is asking: Are you a yes or a no person? I'm still a yes person and think Gordon Brown will look very diminished if he doesn't now call an autumn election. I was on the Westminster Hour tonight and learnt that there is now talk of Britain's first Sunday General Election. There is a rumour that Brown will recall Parliament for a statement on troop draw-downs in Iraq, a vote to authorise an election and enabling legislation for a Sunday poll. 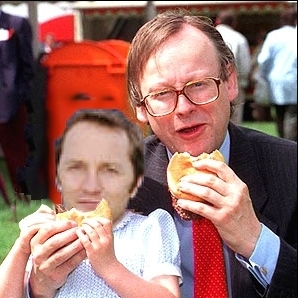 (8) The men's toilets are full of photos of James Purnell photoshopped on to images of great world events. Silly, yes but quite funny. (9) Blackpool is not in good shape for the final scheduled visit by any major political party for its annual conference. I hope the recent switch of political control - to the Conservatives - will do something to restore this once fine seaside resort... but it's going to take a lot of enterprise and time. Floodlighting the Tower in blue for the week is a nice touch. (10) It's 11.45pm and I'm off to bed. My guess is that 99% of other conference-goers will still be drinking for a few hours yet but my day began at 7am with an interview with BBC Breakfast telly and I need my sleep! I've been very impressed by the progress that is being made by Campaign North - a campaign that was showcased during Conference this morning, by William Hague. After six months of operations, twenty extra full-time professionals have been recruited, including regional press officers, research staff, fundraising officers and campaigning professionals. That's a doubling of staffing since the beginning of 2007. A full-time CF organiser is about to be recruited. Every pound raised in the north now stays in the north. That has encouraged a doubling of fundraising since the start of the year. Shadow Ministers have been appointed for Tyneside (Alan Duncan), Manchester (George Osborne), Liverpool (Chris Grayling), Hull (David Davis), Leeds/Bradford (Eric Pickles), Sheffield (Sayeeda Warsi) and Sunderland (Mark Hoburn). Although polls suggest that the 'Cameron Effect' is much weaker in the north, there are some signs of progress. In May's elections the party did particularly well in Blackpool, Chester and South Ribble, for example. The Conservatives now control more councils in the North West and Yorkshire than Labour or the Lib Dems. The party also fielded more candidates in May's elections than either of the other two main parties. The Campaign's focus in over seven to ten years, however. It will take that long to fully build the campaigning infrastructure, improve the field of candidates and develop a full range of policies that will meet the north's challenges. 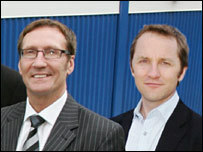 The Campaign couldn't have a better chief executive than Michael Bates (William Hague's Deputy on the Northern Board). William Hague has just wowed the Conference. 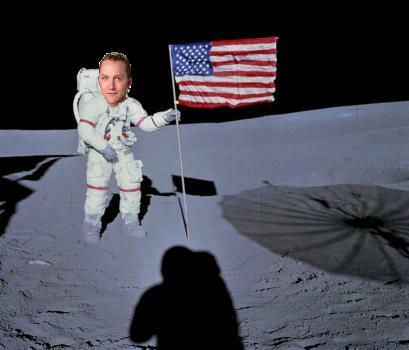 "Some of us stood here thirty years ago with Margaret Thatcher. We, Gordon, backed her when she rescued our country in the face of every denunciation and insult from the likes of you. Margaret Thatcher would never have devastated the pension funds of this nation, nor kicked its small businesses in the teeth. So you may fawn now at the feet of our greatest Prime Minister, but you are no Margaret Thatcher. Gordon Brown is not a conviction politician. He is a calculation politician. He calculates that people will forget who caused the current crises in our health service, our prisons and our pensions. He calculates that he can pretend to be a new government. But he is the old government, and after ten years of failure and disappointment, he cannot be the change the country needs. So, now, Conservatives, this is our opportunity, to show this week the real change that Britain needs. We live in a new world, and the old politics of Gordon Brown are no longer enough." Caroline Spelman has told the Sunday Express that a good proportion of the party's £10m election warchest will be used to expose Gordon Brown. The idea of painting Gordon Brown as a 'calculation politician' is a good one. I think it could resonate. William Hague's speech will have only increased his credibility as a 'comeback Tory leader'. A poll in today's Mail on Sunday found that 19% of the public favoured William Hague to succeed David Cameron. Boris Johnson with 10% was next. David Davis and Ken Clarke were both on 7%. Liam Fox enjoyed the support of 4% of the public. George Osborne was on 1%. 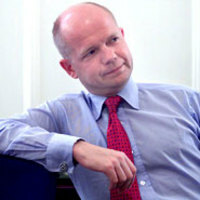 Mr Hague, although 3/1 favourite, told Sky News that he never wanted to be Tory leader again. The party is ready for a General Election: Refusing to discuss the "fluctuating" opinion polls Mr Cameron said that the Conservative Party was ready to go to the country whenever Gordon Brown made the decision. Lots of policy review ideas will be junked this week: The policy reviews were excellent but this week lots of ideas will be junked - there will be no higher taxation of alcohol, no charges on supermarket parking, no VAT on domestic flights, no penalty for a second overseas holiday flight. Green taxes will pay for cuts in family taxation: Green taxation as a proportion of total tax take must go up. Mr Cameron reiterated that any increase in green taxation will, however, go into an independently-audited family fund which will pay for reductions in the taxation of ordinary families. The party is committed to eliminate the couple penalty in the benefits system. Recognising marriage: Every other European country recognises marriage in the tax system. The next Conservative Government will do so, too. It will send a signal that marriage is important. No unfunded, upfront tax cuts: Every tax relief announced this week - including stamp duty relief for first-time buyers - will be fully-funded. There will be no unfunded, up-front tax cut promises. We're not lurching right: The first policy announcement was on the NHS and the GPs' contract and the second announcement on the couples' penalty within the benefits system will help 1.8 million of the poorest people in Britain. There'll be three big themes here in Blackpool: (1) Conservatives will give people more power over their lives - (2) We'll never solve social problems until we make society and families stronger - (3) We'll make Britain safer and greener. The choice at the next General Election... will be whether to continue with Labour's failed record on the NHS, higher taxes and doubled gun crime or to vote for real change with the Conservatives... "I really want this election." On Margaret Thatcher's Downing Street visit: It was lovely to see her outside of Number Ten again. It's not true that I haven't been photographed with Lady Thatcher. I was photographed with her at the unveiling of her Commons statue. Immigration: We will control immigration - we will introduce firm measures - but we will always address the issue in calm, measured language. Although the headline deficit is better than other recent surveys, the underlying numbers remain worrying for the Conservatives. When it comes to handling a crisis Brown has a 60% to 13% advantage over David Cameron. By 37% to 32% the Prime Minister even has an advantage on this issue among Tory voters. Labour also scores much better on party unity. 54% told Ipsos-MORI that Brown leads the most united team. Only 12% say the same of the Conservatives. All polls show that on fitness to be Prime Minister, economic competence and party unity - the three points of the iron triangle of political success - Labour enjoy big leads. A BPIX poll for the Mail on Sunday also gives Labour a 7% lead. BPIX, which is not in ConservativeHome's poll of polls because of its infrequency, finds Labour on 41%, the Conservatives on 34 and the LibDems languishing at just 12%. Coming before the Tory Conference and before the weekend's tax relief announcements - for two parent families and for first-time homebuyers - there must be hope that the opinion polls will be better by next weekend. The above poster (click to enlarge) will be launched later today by Conservative Way Forward. A 3% increase in the fighting strength of the army, navy, and airforce. Higher defence spending was the number one public spending priority recently identified by Tory grassroots members. Greetings from Blackpool! Horrible journey via train but I'm here in the Imperial Hotel. Surrounded by 'It's time for change' slogans on a black background. The photo on the right is of a beermat circulating around the Imperial Hotel: Gordon Brown - Disturbingly Expensive. The Press Association is reporting that the party will promise to abolish stamp duty for first-time buyers on homes worth up to £250,000. This will take nine out of ten first-time buyers out of the tax. Two opinion polls tomorrow will show the Labour lead down to 7%. Not brilliant but much better. 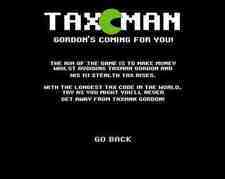 "With the longest tax code in the world, try as you might you'll never get away from Taxman Gordon!" Great idea. A ConservativeHome mug will go to anyone in the high scores on Friday who has the letters "CH" after their name (top-placed person only). What other advergames could be made featuring Gordon Brown? We're looking for someone who's good at making basic games like this, please email us if that's you. A Populus poll for The Times gives Labour a 10% lead - nearly matching the YouGov survey for today's Telegraph. According to another YouGov poll - for tomorrow's Telegraph - Gordon Brown is maintaining the 11% lead that he won in the immediate afterglow of his speech to Labour Conference. Both major parties lose 1% to the LibDems compared to the YouGov/ Channel 4 survey. 45% say that Gordon Brown is most in touch with people’s concerns. 18% say the same of David Cameron. 60% think he is out of touch. 22% think David Cameron is proving to be a good leader. 55% thought that David Cameron is "lightweight" compared to Gordon Brown. 63% said that they don't know what the Conservative Party stands for. William Hague was the clear favourite to become Tory leader if David Cameron stepped down. 58% supported the view that Gordon Brown would win an autumn election but might lose it if he stepped down. 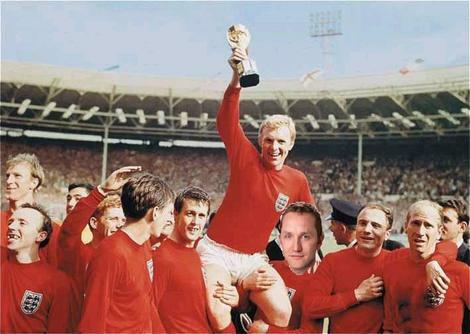 Has James Purnell faked photos before?! Jeremy Hunt MP has described the position of his opposite number - James Purnell, the Culture Secretary - as "increasingly untenable" after it was revealed that he had agreed to have his image added to a photo of a hospital opening - to which he was late. The fake image can be viewed on the right. Mr Hunt said that it would be difficult for Mr Purnell to hold a portfolio which has some responsibilities for addressing the crisis of confidence in the media following revelations of fake phone-in competitions on the BBC and independent TV. That is what the TaxPayers' Alliance is reporting on its blog. We will need to look carefully at the small print of George Osborne's announcement. My guess is that it won't be promised immediately but will be financed from the proceeds of growth. A little earlier I posted a few thoughts on 'next steps for modernisation'. I urged the party to keep emphasising its commitment to the public services; adopt a more achievable environmentalism; embrace the social and international justice reports of IDS and Peter Lilley; defend the rights of adult gay people; recruit genuinely diverse candidates; and adopt a moderate tone. This site has always stood for 'the politics of and' - a fusion of traditional and modern concerns - and whilst we welcome the recent rebalancing it is vital that it does not become a retreat into core vote territory. It's also necessary that as we think about core vote issues again - tax, crime, immigration, Europe - we do so in an intelligent way. I have just learnt that The Sun dropped more than 100,000 sales on Monday when it launched its EU referendum campaign. That's a big drop for a newspaper in the middle of a circulation campaign. Although 65,000 people have signed The Sun's referendum petition I'm far from convinced it's the most important core vote issue. Last month's ConservativeHome survey of Conservative members suggested that you agree. Only 3% thought Europe was likely to be the most decisive issue at General Election. Nearly four times as many thought immigration would be issue number one (hence the importance of today's Mail splash) and 26% put crime as issue one. I hope that the rebalancing will see a focus on crime and immigration - not Europe. I'm only talking electoral strategy here - not about what necessarily matters most in reality. The other important ingredient for a successful rebalancing is that we approach the issues in a different way and I have 100% confidence in David Cameron's ability to achieve this. His approach to crime, for example, isn't just longer, tougher sentences. There are also lots of ideas to help young people off the conveyor belt to crime. And, on immigration, there's a more sensitive language and we've got rid of the ugly cap on asylum numbers that we had at the last election. Later this afternoon I'll post on 'next steps for the core vote issues' but here are a few thoughts on what, not particularly accurately, could be described as 'moderniser or change issues'. Continuing to emphasise the public services. Our polices on schools and hospitals are a bit timid but they're much superior to the command and control policies of Gordon Brown. The environment. Earlier this month I promoted the idea of 'achievable environmentalism'. I mentioned planting trees, recycling, cutting waste, investing in renewables, protecting natural habitats. John Redwood has written today about "practical environmentalism" and highlighted more fuel efficient vehicles, better energy conservation and more intelligent traffic management. Conservatives should be a party of conservation but not a party of higher green taxes or heavy restrictions on development (eg airport expansion). Social justice. At Tuesday's Carlton Club dinner David Cameron noted that there were 600,000 more people living in extreme poverty. The very poorest have got poorer under Labour. Britain needs a Conservative approach to poverty. Stronger families. A freer, more dynamic voluntary sector. Zero tolerance of crime and drugs. School choice. I have no doubt that the leadership is 100% committed to these core themes of a 'progressive conservatism'. International development. It was overshadowed by the fuss over the Rwanda trip, but Peter Lilley produced an excellent report on fighting global poverty. I hope Andrew Mitchell, Alan Duncan and George Osborne will be able to embrace many of Peter's recommendations this week. I'd also like the party to take more action against the trade of arms to despotic regimes. I also wish we'd spoken out against the cancellation of the BAe-Saudi bribery investigation. Respect for gay people. Many people oppose David Cameron's belief that gay couples should be recognised in a similar way to married couples. I don't. I support the freedom of religious adoption agencies to be able to refuse to place children with gay couples but it's right that a modern Conservative Party is a defender of the rights of adult gay people. Candidate diversity. I never supported the A-list but there are many advantages in having more diverse candidates. More people with roots in the north and in the public and voluntary sectors, for example. Candidate diversity shouldn't just be about more women and more ethnic minorities. We should be actively recruiting candidates with real knowledge of poverty-fighting and environmental protection. Changes of tone. Another change for the party to maintain is the change of tone. Sometimes our party's rhetoric has been too harsh. In the last campaign our posters accusing Tony Blair of being a liar reflected more on us than on him. Our campaigning can still be negative but it shouldn't be personal. "All passes have been cleared by the police"
Accreditation: All passes (except very late applications) have been cleared by the Lancashire Constabulary. Phew. More than 8,500 passes have been issued - the best attendance for five years. Slogan: "It's time for change" is the main Conference message. The message - Gordon Brown is good at playing political games but has no vision for the country. Tories are ready for an Election: £10m in warchest. 200 candidates in key seats selected. Manifesto drafted. If an election is called next week the broadcasters have assured CCHQ that the Conference will receive full coverage - to balance the coverage already given to Labour and the LibDems. Lady Thatcher: Won't be attending (and hasn't for a number of years). Last night's by-election results may produce further ammunition to those Labour 'greybeards' who are urging Gordon Brown to be cautious about an autumn General Election. We listed other risk factors on Monday. On the basis of yesterday's results the Conservatives would have a 6.2% lead over Labour - a very different picture to the national opinion polls which actually suggest a 5.8% Labour lead (according to ConservativeHome's Poll of Polls). The Conservatives won a seat from Labour on Sunderland council with a 3.7% swing. In a Kent County Council by-election there was a 5.5% swing to the Conservatives although Labour held a seat on Dover District Council. Perhaps the most encouraging result came in Cheshire. A 6.5% swing from Labour to the Conservatives ensured that Eleanor Johnson was elected and that the County remains in Tory control. The Gowy seat includes three important polling districts in the target Tory seat of Chester; Christleton, Littleton and Guilden Sutton. More encouraging for me is the main story on the front page of The Telegraph: David Cameron orders shift to core Tory values. An interview with George Osborne indicates that the party will ditch large parts of the Gummer-Goldsmith report. There'll be no charges for supermarket parking. No taxes on a second short annual flight. There may even be a promise to reform inheritance tax. I'm also expecting stronger statements on immigration. Shadow Immigration Damian Green was on the Today programme this morning and the front page of The Mail shouts: Two million more migrants in just a decade. Mr Green is quoted in that story saying: "This rips apart the Government's previous complacent assumptions about net immigration." I hope we'll also see Tory reluctance to talk about immigration ripped up in Blackpool, too. A ConservativeHome poll of Tory members - due to be published tomorrow - will spell out what the grassroots would like the leadership to do next. Brown hides behind the UN as Burma's protestors join the list of the peoples failed by the "international community"
At least nine people have been killed during the latest Burma protests but the United Nations has failed to act. In an emergency meeting last night China and Russia defied calls from democracies, led by France, to punish the Rangoon regime through a variety of economic measures. Russia's Ambassador to the United Nations - explaining his nation's reluctance to act said that Burma needed a "return to security". In stage four say that there was something we could have done but it's too late now. In the world where multilateral institutions like the UN and EU are hero-worshipped we don't even need those Foreign Office lines. Politicians like Gordon Brown can go straight to the 'action must be taken and the UN must take it' line. They appear decisive but they can talk in the full knowledge that the UN won't act. It is an institution of convenience for politicians wanting to talk tough but unwilling to walk tough. "This week was about killing David Cameron and the Conservatives; not defeating them or inflicting a set-back but wiping them off the map. It is important that the nature of this project is properly understood. The smartest ministers know that Cameron is still the best of his Tory generation. They will not want him around much longer and sense that his party will disintegrate if they can inflict a heavy defeat quickly. Brown's building of a big tent is cleverly designed to stress that he runs a national government so all-encompassing that there is no requirement for that old-fashioned concept of a functioning opposition." "The last thing a modern, diverse, international-class capital like London needs is a fogeyish, bigoted and upper-class twit for its mayor. For all Cameron's claims to localism, his is the party which abolished London's city government, starved councils of cash, and created a centralised government worthy of Napoleon. The Tories have never trusted the people, whether they were single mums, miners, or the millions on the dole, and no amount of open necked-shirts will make us forgive or forget". Ken Livingstone also got in on the act of attacking the Conservative Party's "backward blond element" by declaring what a pleasure it was for him to deliver the "first annual Boris Johnson memorial lecture". Last Saturday we noted General Sir Richard Dannatt's call for society to do more to honour Britain's servicemen. You can agree or disagree with the conflicts in Iraq and Afghanistan but all of Britain should be able to unite in saluting the dedication and bravery of our troops. The news coming out of Burma is gripping. BBC Online is reporting that thousands of monks and their supporters are marching despite baton charges from the authorities. There are suggestions that Aung San Suu Kyi has been taken to prison and that internet cafes are being shut down. "Burma's junta is guilty of every conceivable human rights violation. It has the highest number of forcibly conscripted child soldiers in the world. It spends more than 40 per cent of its budget on the military, and less than 60p per person per year on health and education combined. Since 1996, the regime has destroyed more than 3,000 villages in eastern Burma alone. More than a million people have been forced to flee their villages, and are on the run in the jungle without adequate food, medicine or shelter." "We also look to the international community to honour its ‘Responsibility to Protect’. We have a duty to protect those who suffer at the hands of oppressive regimes such as the Burmese junta. We must stand united with the brave people who have taken to the streets in Burma in the last few days, people who are prepared to risk their lives to achieve democratic rule – the rights we take for granted." At last night's Carlton Political Dinner over £250,000 was raised for target seats. Tory donors mixed with shadow cabinet ministers and listened to remarks from Simon Woolfson, David Cameron and Boris Johnson. Speaking confidently, without notes, David Cameron attempted to answer four big questions. My summaries of his answers to his own questions are not verbatim. Why are we behind in the polls? New Prime Ministers always get a boost. It happened with John Major. But the boost won't last because the facts of politics haven't changed. NHS A&E wards are still under threat. Gun crime has still doubled. Taxes have still soared. Disposable incomes are still under pressure. Five million are not in work. 600,000 more people are in extreme poverty. And Labour aren't competent: We've had the first run on a bank for 100 years and the Foot and Mouth outbreak originated from a government lab. How are we going to knit our policies together? Until recently people didn't think we had enough policies. Now most critics seem to think we have too many! The policy review process was good. People from outside politics helped us rethink key issues but it's now a time for choosing and in Blackpool next week the key policy priorities of the party will be clear. What are the party's clear and simple messages? Conservatives want to give people more control over their lives. We want to encourage a new generation of homeowners. We want headteachers to have more control over their schools. We want real choice for patients. Tax is too high and so we will share the proceeds of growth. We will mend Britain's broken society. In the 1970s the problem was irresponsible unions - today it's irresponsible parents. Then it was inflation. Now it's crime. The overall aim is a safer, greener country. Conservatives will tax pollution - not families. Opportunity, Responsibility and Family are the new Conservative watchwords. Are we ready for a General Election? If Gordon Brown calls it - Yes. We have a £10m fighting fund. We have nearly all candidates selected. Two million newspapers were distributed in target seats last weekend. The choice for Britain is more of the same with Gordon Brown or real change with the Conservatives. Anger: I'd like to see David Cameron get a little angry about what Labour has done to Britain. He shouldn't get personal with Brown - no way - but voters should know that David Cameron has passion. Attachment: There weren't any stories last night to bring the message alive. David Cameron needs to know that he is connected with the problems of Britain and with the people who are experiencing those problems. Authenticity: The most important of all and related to the other two. David Cameron must make it clear that his leadership isn't a political exercise but a personal mission. By demonstrating a little anger and a lot of attachment he will demonstrate his authenticity. 11.30am: Nadine Dorries MP reports for the Cornerstone blog on David Cameron's pep talk to MPs.